← The story of Me, My Beloved and an Architect. A Flowchart in Three Columns. 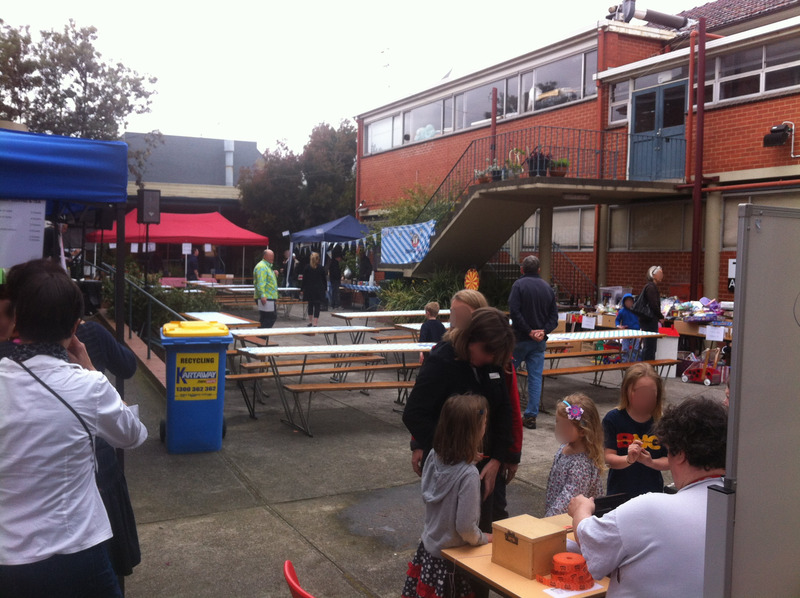 Saturday was our school fete. While these are a fairly normal part of life for many schools in Australia, I realised recently that they’re not something that happens everywhere. In Australia, as in most countries (at least most where I have readers), schools are funded by the government. Parents are expected to make a “voluntary contribution” which is an interesting redefinition of the word voluntary (there is a lot of followup if you choose not to make that payment or can’t afford to do so) as well as to buy “essential educational items” (usually by paying a lump some to the school which then provides them). Some “private” or “independent” schools also receive income from parents who pay fees, which vary from around $2000 a year to well over $20,000 per year. This funding, however, particularly for the government and lower-priced independent schools, seems to fall short of funding what the schools want to provide. In the case of Otto’s school, which is an independent school, there is a need for a sports ground which we currently do not have and which could easily cost $300,000 to build. And so, schools do fund-raising. Sometimes they do lamington (or pie, or donut, or hot cross bun, or cupcake, or …) drives – where each family is invited to shake down family, friends and colleagues to order as many of the particular cake item as possible. 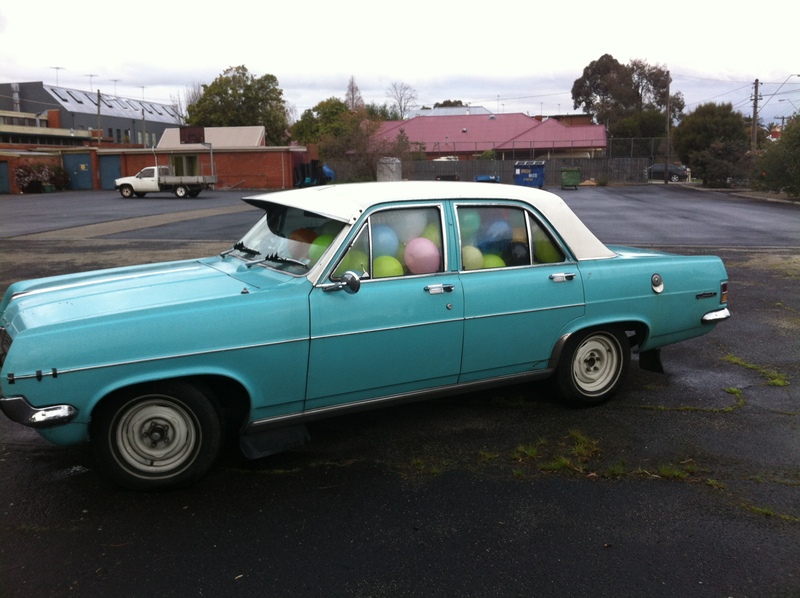 They are then all delivered to the school in one massive lot, and parents deliver to their clients. There is usually a prize for the child or family who sells the most. Ditto chocolates. Or tooth-brushes. Or mangoes. etc. Some do walkathons (or other —athons), or wash cars, or make and sell cookbooks. But the best fund-raiser of all is often the school fete. When I were a lass, this meant a sausage sizzle and a cake stall and a few manky plants that someone had dug up the night before. These days, though, fetes are big business. Some schools apparently even hire professional fete organisers. Otto’s school has 49 students at the moment, from around 34 families. So there are some differences, principally around what we can staff. Despite this, we managed to put on a pretty amazing fete, and our informal exit polls showed that people had a great time. And so did we – and it was beautiful to see the school community come together to work so hard to make our little school shine. The fete co-ordinators have spent 5 years really bringing it all together now – and their experience showed. Each year, it gets a little better (and a little more profitable too). Of course we don’t make $75,000 from the day, but our per-student rate is pretty incredible. Gingerbread hearts are always popular. 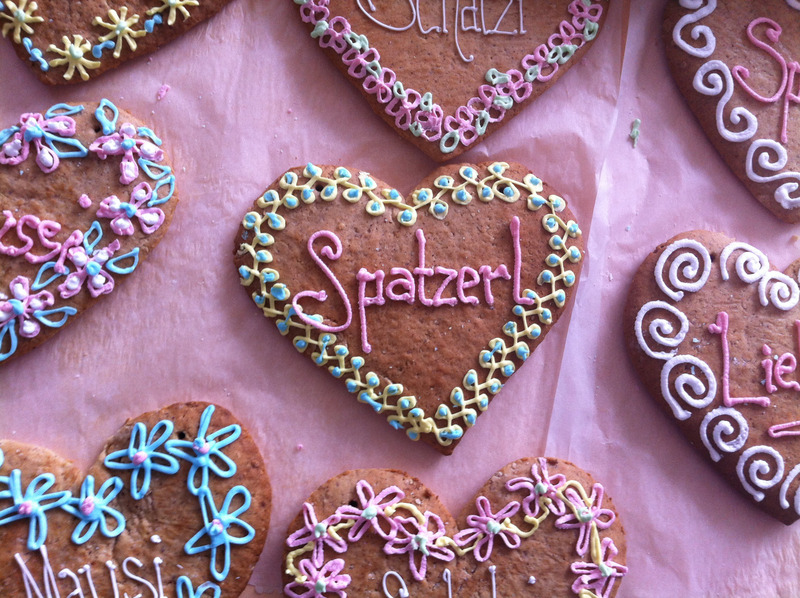 This one says Spatzerl (little sparrow). For the Christmas market, we’re thinking of doing some blanks that we can write on on the night. It’s lovely to welcome volunteers from outside the school too, some of whom have come every year to volunteer their time, as well as other community members who come in for the day or for lunch, for “a little slice of Europe”. A good friend of ours drove 40+ minutes to come to the fete, then won third prize in the raffle. Virtue is sometimes its own reward, although she wasn’t sure quite what her partner would make of their new yellow spotty beanbag. Other friends were in town from Sydney and made the trip over for lunch. My mum and dad came out and then mum spent 4 hours selling jams and preserves, barely taking a break at all. Still setting up. Later, this courtyard was filled with people eating, drinking and being merry. Tables were full all day. either of the two fabulous bands (I had a little weep the second time they played Forever Young) (Because it was so good, not because it was so bad, like that craptacular version they used to play on The OC). 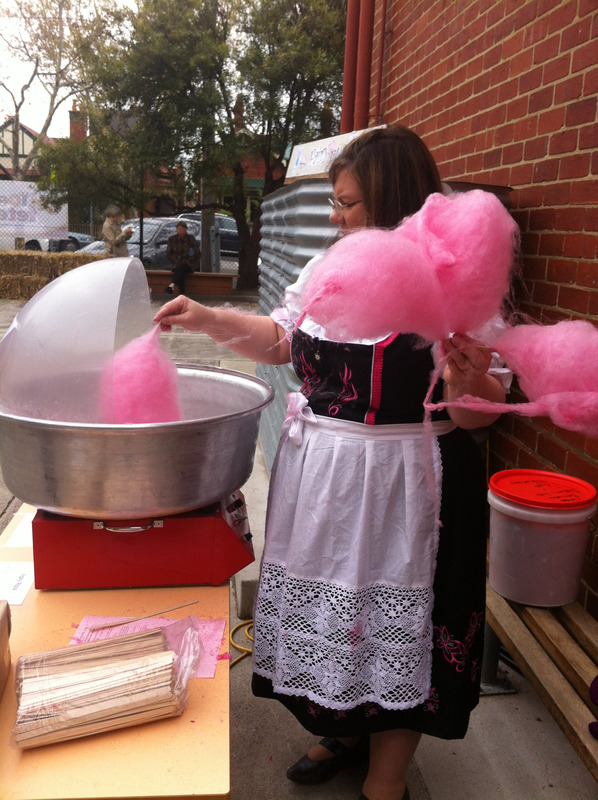 Worst fairy floss maker in the world. The zoomed in version of this photo shows that I have fairy floss all over myself, including in my hair. A friend has a shot of me with it on my nose! But at least here we can pretend they are Biersteine. And the funniest moment (for me, if not for the Bigster) was probably before I realised that my Dirndl did actually have a pocket, so I was having a braphone day, and I was up to my elbows in fairy floss but wanted my phone, and completely horrified the Bigster by asking her to OMG REACH INTO MY TOP AND GET MY PHONE OUT. Apparently it would have been better to ask someone I was not related to, or so she saw it (Note: The phone was over to one side, practically on my shoulder.). She did it eventually, which is why I have the above photo of me scowling at the fairy floss machine. Which richly deserved the scowl. And then I realised that I should perhaps not make jokes to strangers about licking my dress, even though there was probably enough sugar on it to keep me going for a week. And all day Sunday, there were texts flying about what a wonderful day we’d had (and how knackered we were). And a friend and I went off to markets around town, lining up stallholders for our next big event, because sometimes the fun just doesn’t stop. But the real beauty of our school fete – the thing that makes it stand out in comparison to other events – is not in the money that it raises; it’s in the way that the entire school community comes together for a day, baking, selling, running errands, even cleaning the toilets, to make sure that it is as lovely as it can be.